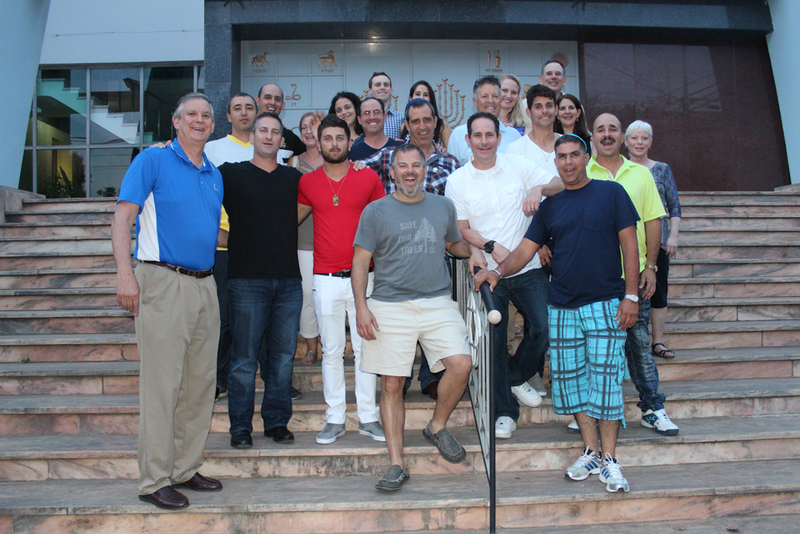 In March, 14 of our Maccabi Family embarked on a mission to Cuba in an effort to help out the Jewish community in Havana – to bring important medical and sports supplies, to conduct a clinic in Fast-Pitch Softball and to lend moral support to the small but dedicated Jewish community of 1,500 strong. We were so impressed with the dedication of this wonderful group, yet quickly became aware and sensitive to the needs that they have. One of our participants, Paul Rubin, put his thoughts down and I share it with you, below. We hope that you will join in this campaign to assist the Maccabi Cuba delegation and other Jewish Communities in distress, to fulfill their dreams. Their immediate need is to secure funding for 33 athletes at $2,000 each for a grand total of $66,000, which is our goal. Those of us on the U.S. Masters Fast-Pitch softball team that played in Israel at the 2013 Maccabiah Games became instantly intrigued by the presence of a squad representing Cuba. During the competition, we befriended many members of the Cuban team, and learned how some players had made Aliyah to Israel and others were visiting Israel for the first time. Those still living in Cuba told us that the trip was a thrill of a lifetime. They described their native country in loving terms, but conceded how difficult it is for most Cubans to eke out a living. Several Cuban players came by our dugout before our Gold Medal game against Canada to wish us well and to pose a question: Would we consider visiting Cuba and maybe playing some ball? Back in the States after the Games ended, we began chatting with each other about the possibility of doing just that. In late 2013, we started to do our homework on what it would take for us to get to Cuba. We soon learned that the logistics of taking a group there would be a multi-layered challenge. We reached out to Jed Margolis, Executive Director of Maccabi USA, and told him of our goal—to go to Cuba on a humanitarian/religious/cultural/sports mission, to rekindle our friendship with our fellow Jewish ballplayers, and to embrace the small, but vibrant Jewish community there. He expressed an immediate interest of pitching in. We successfully jumped through untold hurdles and settled on a departure date of March 18, 2015. Our group was 14-strong, including six Maccabi USA Fast-Pitch alumni. When we boarded the charter plane in Miami for the short hop to Havana, all we could do was smile. Everything about this adventure, especially the warmth of our Cuban friends, was wonderful, memorable, even life-changing. We spent an afternoon at a Havana ball field, working together on our game, and playing a game of Fast-Pitch with an ebullient group of Cubans. Some were members of their 2013 Maccabiah team, while others were non-Jewish guys who came by to support their friends. Appropriately, the game ended in a 4-4 tie. Each of us brought to Cuba much-needed ball equipment and other materiel that the ballplayers and the community at-large desperately need, including gloves, cleats, Gatorade powder, sunscreen, bats, balls and other materials we take for granted in the States. The afternoon of our second day in Cuba set the tone for the entire trip—we were getting to know about good people with whom we have much more in common than not. We spoke with anyone and everyone, and found the Cubans we met to be open—even hungering—for dialogue and true friendship. They don’t hate the American people, not at all, though they may have been raised under the Castro regime to hate the American government, no matter who’s in charge of it in any given political cycle. And one thing we learned for certain: Cubans love Baseball (and, by proxy, Fast-Pitch Softball). One day we journeyed out to the Jewish Cemetery (established in 1910), set on a rolling hillside outside Havana. There we experienced the unexpected: Tombstones (some battered and bruised due to time and inattention) that told amazing stories—young Cuban Jewish martyrs from the 1930s who lost their lives fighting a pre-Castro dictator. Another site dedicated to the memories of those lost in the Holocaust. Everyone in our group was moved. Near the end of our Saturday night Havdallah celebration at the Temple Beth Shalom, Mike Goldman, teammate and the chairman of the Maccabi USA Fast-Pitch program, stepped to the microphone. He promised the gathering that this trip marked the start of something long term. Mike spoke of having a ball tournament in Cuba in early 2017, as a kind of spring-training session before the Maccabiah Games in Israel that summer. The excitement in the room was palpable. Before we broke up for the evening, we spoke with our Cuban friends about their dream of competing at the Pan American Maccabi Games this December in Santiago, Chile. Our dear friend Alex Eskenazi, captain of the Cuban softball team, told us they would love to go, but simply don’t have the money. Alex is a proud and dignified young man, and he was not begging—he was just telling it like it is. We need to step up to the plate and help the Cubans make it to Chile, both for them and for the rest of the Jewish sporting community.